This Capsicum and Salami Pizza is the perfect no fuss, quick dinner. It’s also great to use up some vegetables that have been neglected during the week. We seem to always have an abundance of green capsicum so we recently made this version. You can make your own pizza bases (click here for the recipe), or you can simply buy one or use pita bread for a base. The rest is not rocket science. Pop your pizza tomato paste sauce on the base and top with ingredients. It’s a great movie night dish to share on the couch and is equally delicious the next day. Change up the ingredients depending on what it on hand in your freezer, whether veggies, deli meats or cheeses. Preheat the oven to 250 degrees Celsius. Alternatively, if you have a pizza stone, place it on the barbecue and turn to high heat. Spread the tomato paste on the pizza bases. Put the salami down first and then add the vegetables. Top with the olives and soft cheese. Cook the pizza for five to ten minutes or until the crust is golden. 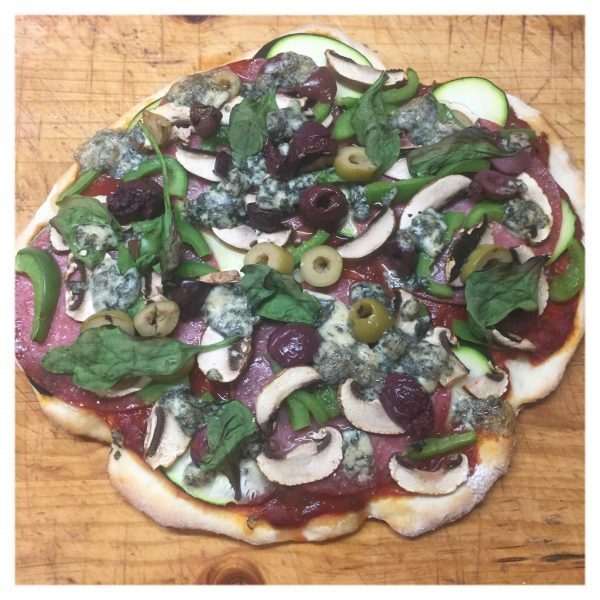 This entry was posted in Recipes, The Organic Place and tagged Capsicum and Salami Pizza, healthy recipes, leftovers, organic eggplant, organic veegetables, pizza, recipe, recipes, The Organic Place.